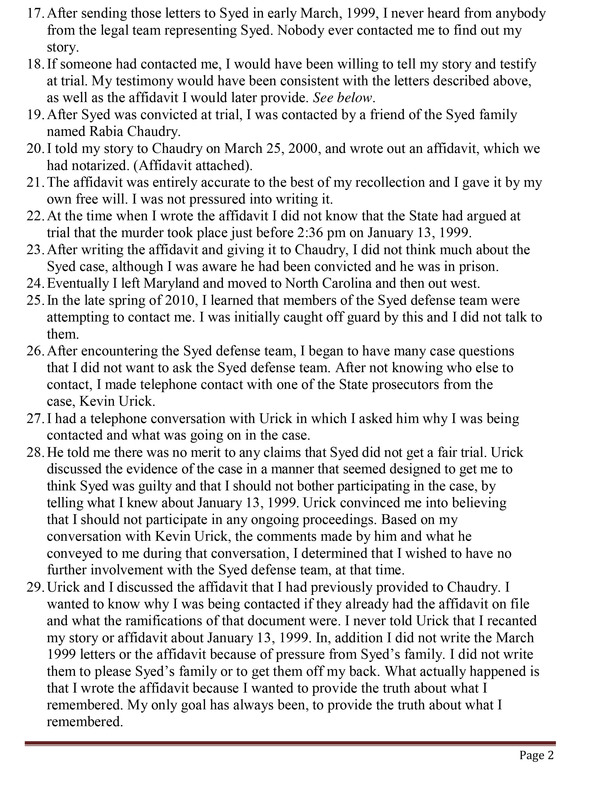 This is the call log from Adnan's cell phone for January 12 and January 13, 1999. 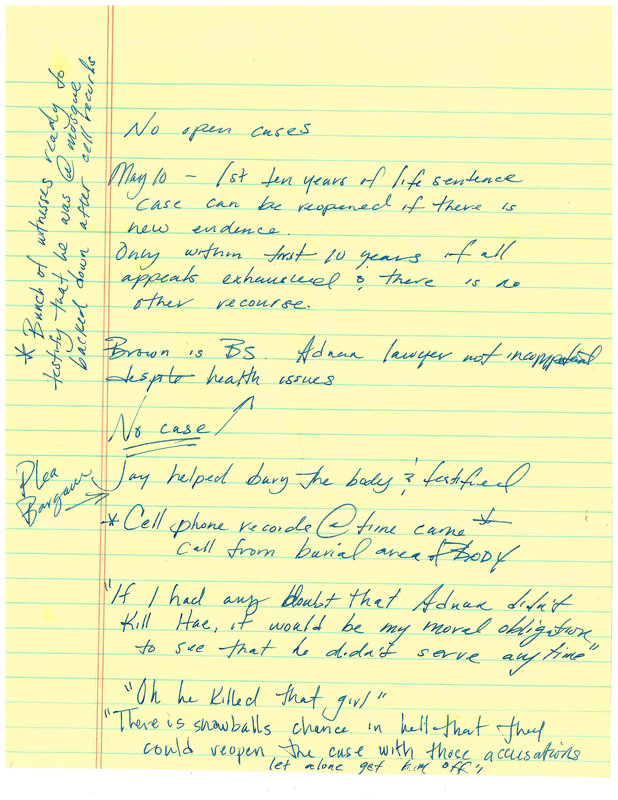 Detectives’ notes from an interview with Adnan’s friend Ja’uan Gordon. 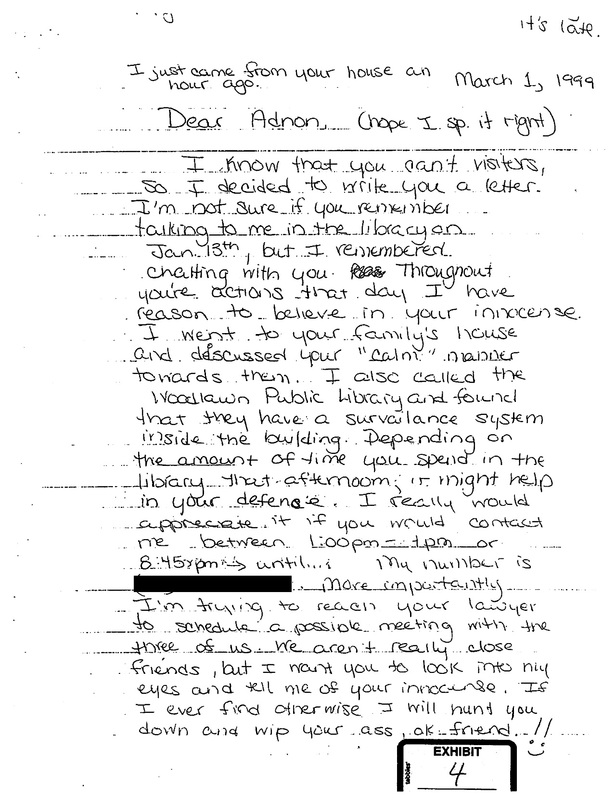 This is the first letter Asia wrote to Adnan right after he was arrested. In it, she describes talking to him in the library on the afternoon that Hae disappeared. 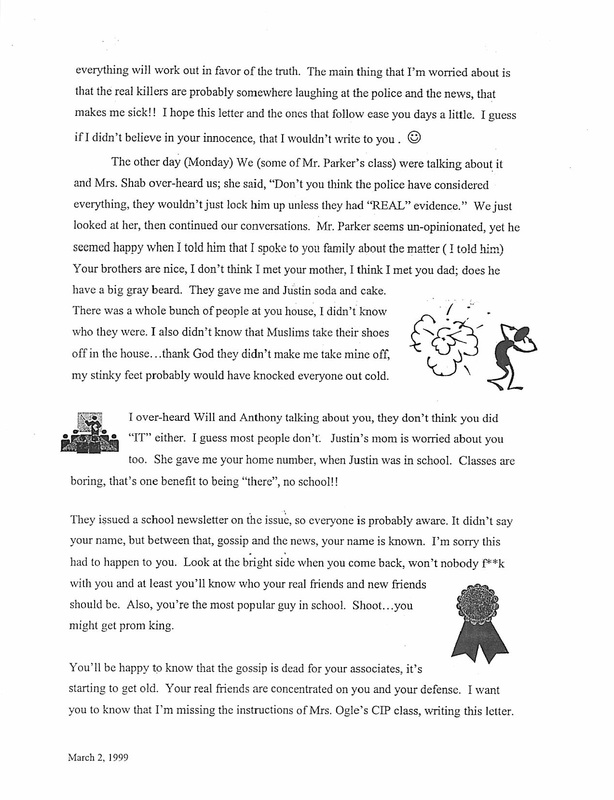 Asia's second letter to Adnan. In this one, she gives him a sense of the mood inside Woodlawn High School and the reaction to his arrest. 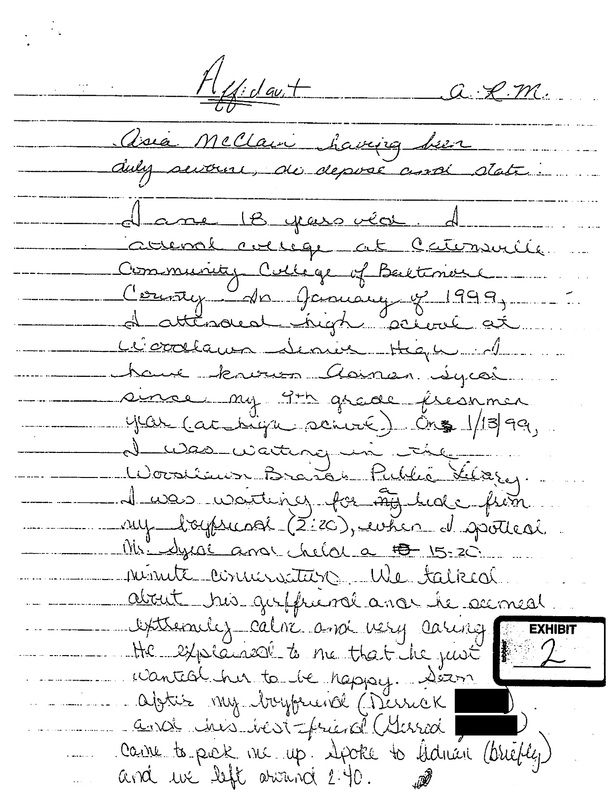 Asia wrote this affidavit soon after Adnan was convicted, at the request of Rabia Chaudry, a friend of Adnan's family. 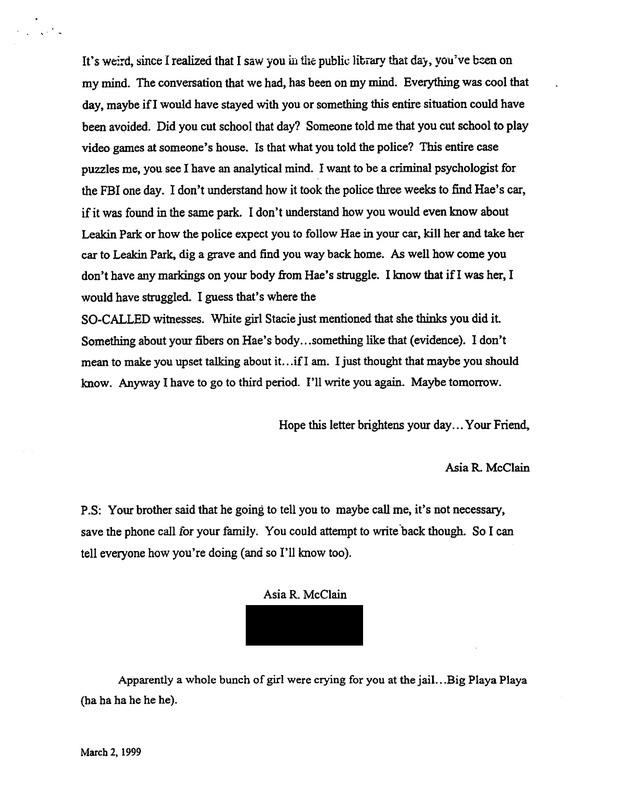 Asia wrote this affidavit after hearing prosecutor Kevin Urick on Serial. 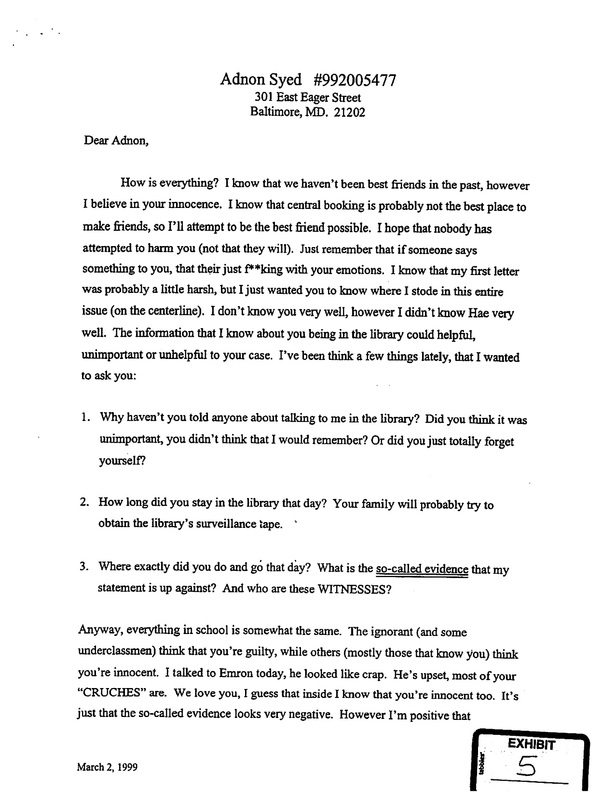 She reaffirms that she saw Adnan in the library on the day Hae disappeared. 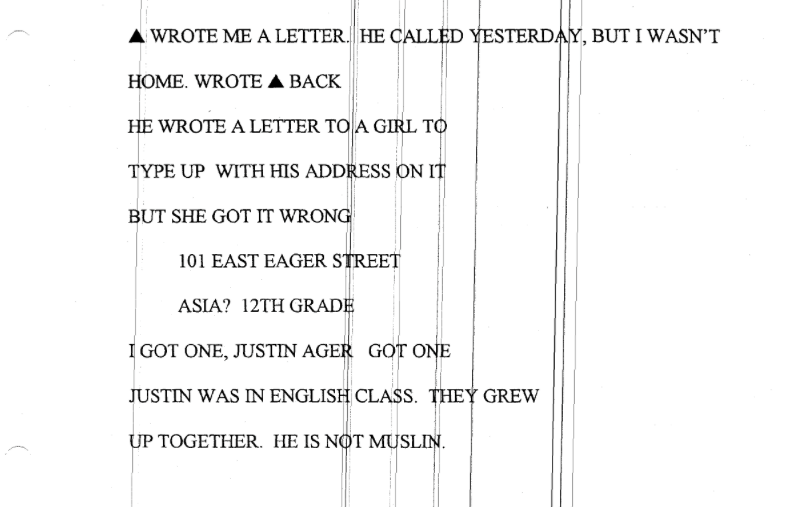 Asia says she decided not to testify at Adnan’s original post-conviction hearing in 2012, after a phone conversation she had with Urick. 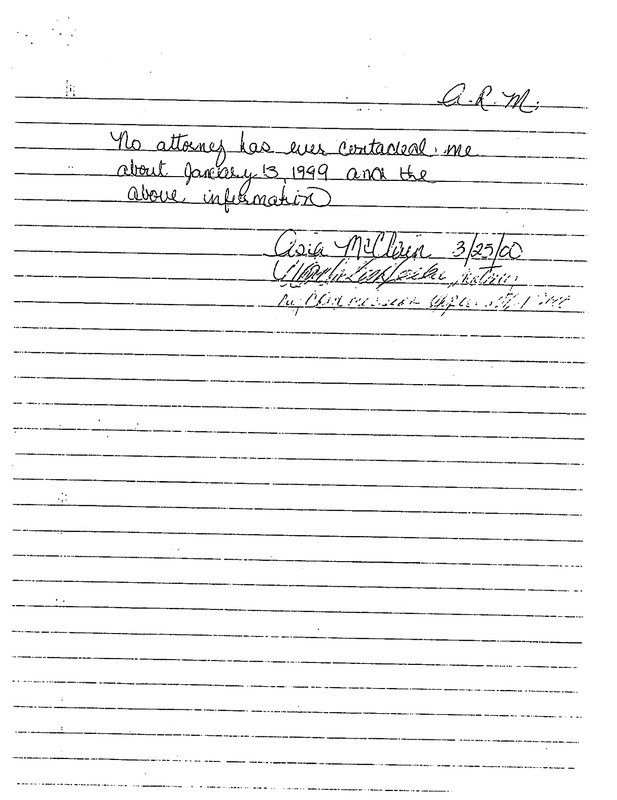 Asia McClain didn’t testify about her alibi affidavit in Adnan’s first post-conviction hearing in 2010. She says prior to the hearing, she contacted prosecutor Kevin Urick to ask him about the case and he gave her the impression Adnan was certainly guilty so she decided not to get involved. 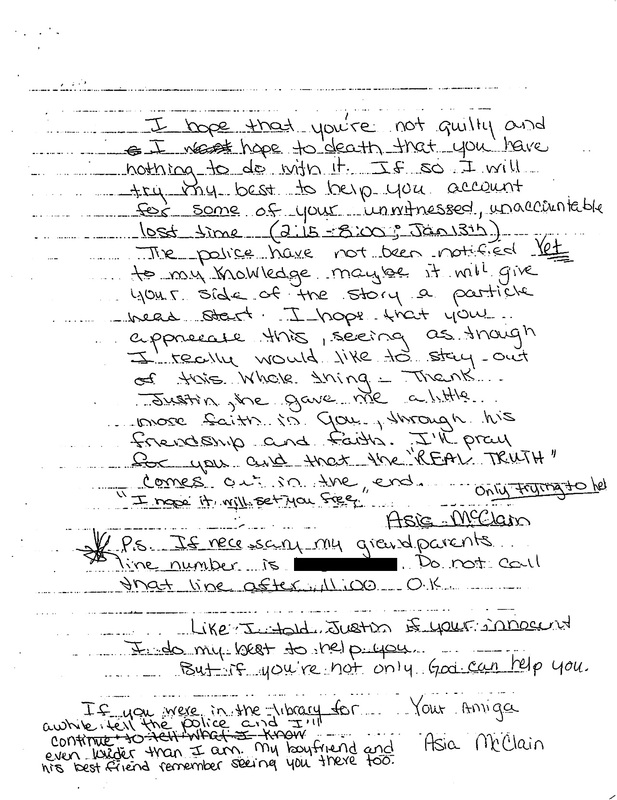 These are the notes Asia says she took from that phone call. 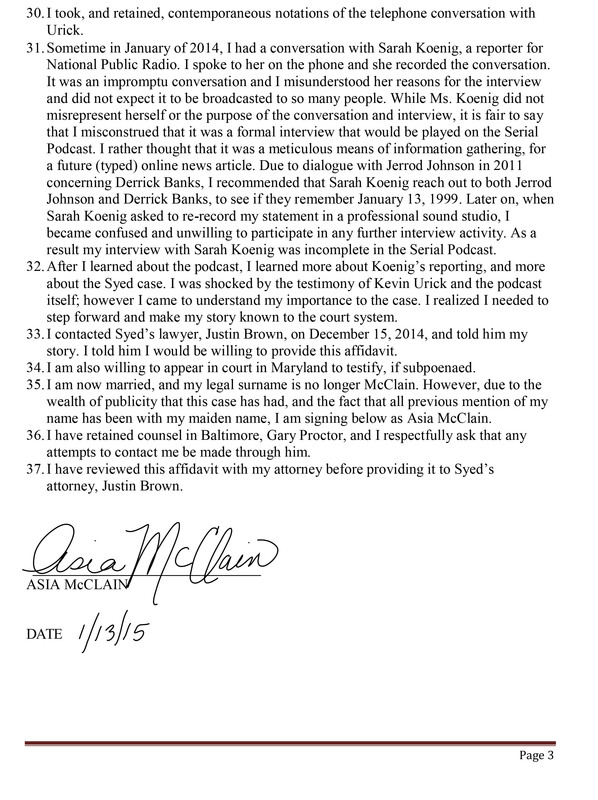 Brown in the “Brown is BS” comment, is Adnan’s current lawyer, C. Justin Brown. Last week, when I saw the news that Judge Martin P. Welch granted Adnan a new trial, I happened to be on Skype with our Executive Producer Julie Snyder, and both of us did exactly the same involuntary thing of sucking in our breath and then putting our hands over our mouths. 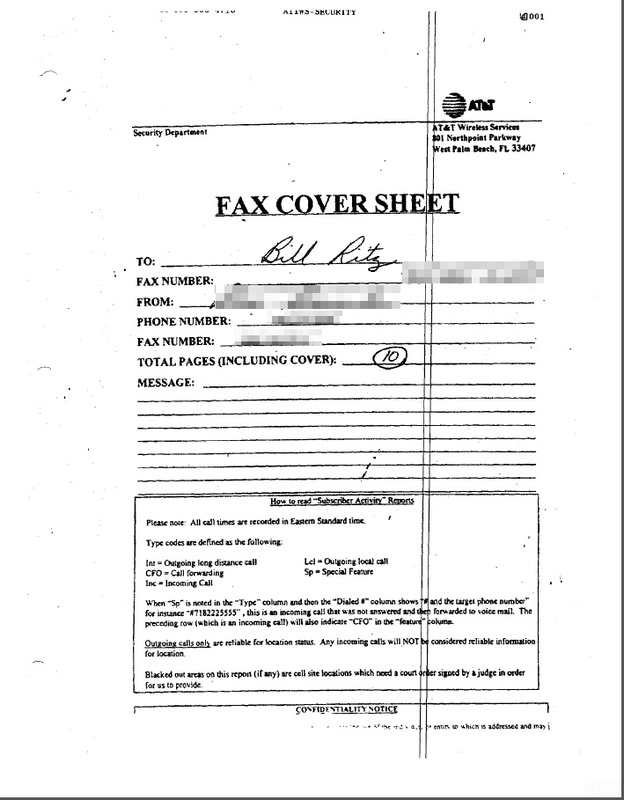 We weren’t so much shocked because of the legal arguments, but because it was such a longshot, this outcome.